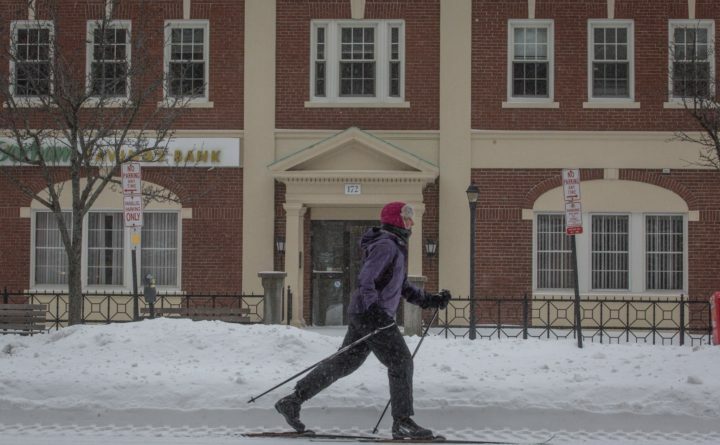 A cross-country skier makes tracks down Commercial Street in Portland on Sunday. A major winter storm that blew into Maine overnight Sunday started off strong but brought less snow than anticipated after it turned into sleet mid-morning. Originally forecast to bring 18 to 24 inches to Greater Bangor, the storm, as of 10:40 p.m., dropped 8.4 inches of snow over the area. Snow changed to sleet over Greater Bangor before noon Sunday — with periodic bouts of fine, powdery snow following — and holding down snow accumulation, the bulk of which fell by early Sunday afternoon, according to the National Weather Service office in Caribou. Elsewhere in eastern and central Maine, higher totals were reported, with 9.1 inches in Millinocket, 12 inches in Brownsville Junction, 8.4 inches in East Surry, 6 inches in Bar Harbor, 10.2 inches in East Machias and 7.8 inches in Eastport, according to the weather service office in Caribou. Up in The County, snow by nightfall began to pile up, with 16 inches in Presque Isle, 10 inches in Mars Hill and 14.8 inches in Caribou, according to the weather service. The weather service was forecasting the heaviest snowfall in Piscataquis, northern Penobscot and Aroostook counties, where 18 to 20 inches were expected to fall over the region by the end of the day. Along the Down East coast from Bar Harbor to Eastport snow was followed by 1 to 2 inches of sleet and up to a half inch of freezing rain on Sunday afternoon. That icy precipitation paired with winds blowing about 15 to 20 mph and gusting up to 30 mph posed a “significant problem,” Mal Walker, a meteorologist at the weather service office in Caribou, said Sunday morning, and increased the likelihood of power outages along the coast. Neither Emera Maine nor Central Maine Power reported significant outages. 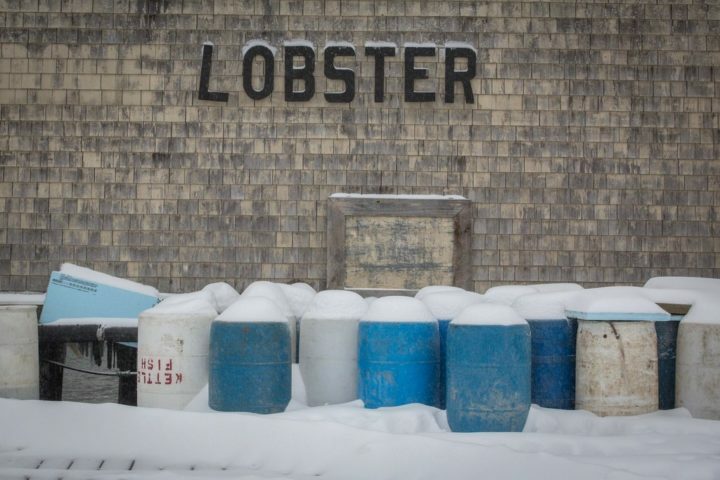 Snow drapes it’s self picturesquely over bait barrels on a Portland wharf on Sunday. The entire state was placed under a winter storm warning, and the speed limit on the Maine Turnpike was reduced to 45 mph. With heavy snow Sunday morning making for rough driving conditions, houses of worship across the state canceled morning services and businesses closed doors for the day. Portland’s public bus system suspended its Sunday service ahead of the storm, and buses will resume running on Monday. The storm forced a number of inbound and outbound flight cancellations at both the Portland International Jetport and Bangor International Airport. Overnight parking bans were in effect for a number of Maine cities, including Bangor, Portland, Auburn, Augusta, Biddeford, Boothbay, Brunswick, Falmouth, Freeport, Gardiner, Gorham, Lewiston, Rumford, Saco, Scarborough, South Portland, Topsham and Westbrook. Meanwhile, snow turned over into sleet and freezing rain mid-morning Sunday in southern Maine and along the midcoast as the storm progressed through the state, according to Eric Sinsabaugh, a meteorologist at the National Weather Service office in Gray. Higher amounts are expected inland toward the western mountains. That freezing rain and sleet reduced snow accumulation in the southern part of the state, where 8 to 12 inches were expected to fall, down from 12 to 18 forecast last week, Sinsabaugh said early Sunday morning. Bristol in Lincoln County saw about 10 inches of snow, with 4.2 inches in Portland, 11 inches in Rockland, 7.2 inches in Gray, 7.5 inches in Augusta and 7 inches in Eliot, according to Derek Schroeter, a meteorologist with the weather service’s Gray office. Winds blew across the southern part of the state at sustained speeds of 10 to 20 mph and gusts up to 25 mph, Sinsabaugh said. Those winds increased toward nightfall. “Big winds will come on the back side of the storm as it blows out tonight,” Sinsabaugh said. “It’ll be a pretty brutal day,” Sinsabaugh said.